I'd like to share a great question received this week which highlights a number of recent topics that have been discussed via the newsletter or blog – the irrelevance of individual trades, the imperfection of ALL exit strategies, plus patterns vs context and the way price movement influences other traders' decision making. I stumbled onto your website over the weekend and found it quite informative. 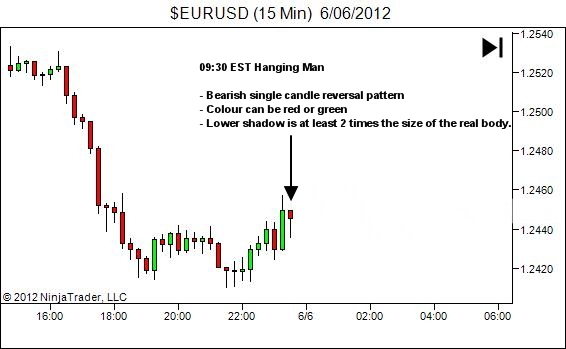 I was trading the eur.usd today, June 5, 2012, and was long on a run that started approximately 08:15 est. at approx 1.2412. I was watching 5 and 15 min charts, macd, stoch. rsi. I made it through the first retracement without selling, but at approx. 9:30 est a hanging man appeared on the 15 min. chart. All other indicators except the 5 min macd looked positive. Although my gut instinct was to stay in, I exited at 1.24475 deciding not to risk the profit I already had. The run then continued to 1.2462 and started to pull back. Apparently the hanging man didn't make any difference. I was curious about your take on the matter as you seem to have quite a bit of trading experience. Please note: My chart timezone is different. The bullish price swing traded in the question commenced from the lows just after 22:00. 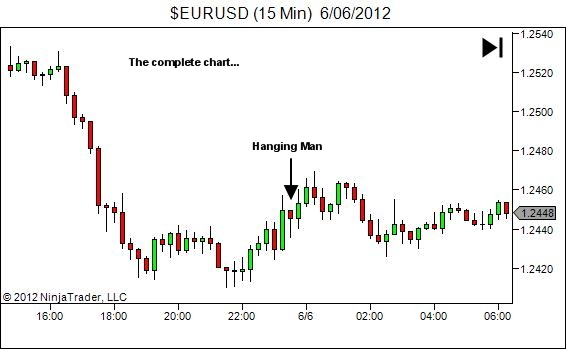 This is not how I trade, but in any case the hanging man had not triggered any exit. The pattern was not confirmed and in effect was simply a pullback in the short timeframe uptrend. It did however provide an indication of supply at this level which continued to display for 3 more candles before finally overcoming the bullish orderflow. You reacted at the first sign of bearish pressure. Your idea was fine (I'd also be watching for a partial exit in this location)… just too early. If you'd like to lock in profits at such an early "potential" signal then consider using only a partial take-profit; maybe also with a plan to get back in if the move continues (ie. managing risk through size). 3. You said, "Apparently the hanging man didn't make any difference". A pattern can't make any difference. What makes a difference is the net orderflow that results from other traders' interpretation of the current pattern sequence. Learn to see the market movement within the context of the higher timeframe structure, and from that consider how other traders are feeling. Find places where they are feeling forced to act out of fear or greed. That is your edge. But that edge wasn't evident in this sequence. Overall though… great question and great trade… nice profit. Well done. Be happy. Move on to the next.